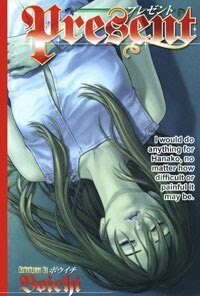 This week I am going to do a little double-feature of one-shots by Boichi. 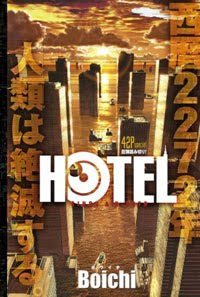 The first being a title called Hotel. This is a very interesting piece as it almost exclusively inner monologue. The inner monologue is something almost entirely absent from manga genre. Which is interesting as manga is modeled after cinema and while the inner monologue isn't as popular as it used to be, it's still around. Perhaps it was felt that the inner monologue took the reader out of the action to much, as spoken about in the title A Drifting Life? In this case the inner monologue is an intergeneration part of this sci-fi story as we learn humanity has caused world ended global warming. While some struggle to build an ark to send human DNA out into space, others are working on building a tower to house the DNA of all the species of life on Earth. A hotel of sorts, where the manager is a computer AI. With it's inner monologue we learn what befalls humanity. The second title is a story titled Present. What happens when a student who has fallen in love with her teacher a present for Christmas? What happens when she falls incredibly ill? What will the final gift to all involved be? This is pretty simple story with a sci-fi good twist that is just told very well. It also has a very small connection to Hotel. Both of these titles have wonderful art. Lots of little details are really what make it great. The humans are drawn well, and have good line work but they don't come off anything astounding. It's the detail in the sci-fi elements that make the titles feel so rich. All the mechanical designs are very details and feel very realistic. The color pages in both are also great, with some very fluid feeling CG to them. Both of the titles this week are only 40 pages each, making them quick fun reads. They make good toe wetting titles to some more serious sci-fi stories. If you are into the one-shot format, these are must reads. They are shinning examples of what can be done in this form to draw you in emotionally.